This spinach banana smoothie is so fast to make because it only contains 2 ingredients AND it is super tasty because you can’t taste the spinach at all – I promise! Most people don’t know that you don’t actually need liquid to make a smoothie. That’s right. You can actually make a smoothie just with fruit and no liquid. All you need to do is make sure you add enough fruit chunks to cover the blender blades so they actually turn. (This is where a personal blender may prove handier than a large blender). And you gradually increase the speed until your fruit becomes liquid. As fruit contains a high amount of water, it actually turns into liquid in your blender and creates a nice thick shake consistency without the use of any powders or fillers. To keep things ultra quick for you, I am only using 2 ingredients so this will be the speediest smoothie in the world. 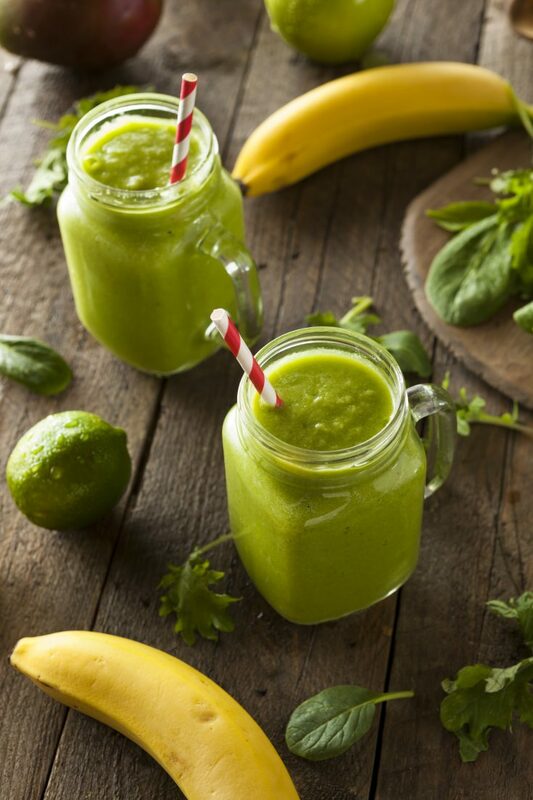 Once you’ve blended up your bananas into a liquid, then you add your spinach and blend until smooth. Viola, an ultra fast, spinach and banana smoothie with just 2 ingredients! For full instructions see the printable recipe card further down. Now that you know how easy it is to make this smoothie, let’s talk about why you should be including this smoothie as part of your diet every single day. Smoothies are an innovative way to consume your fruits AND veggies. 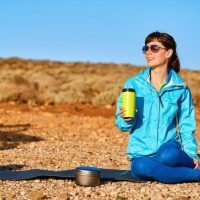 And what better way to enjoy the nutrients from these plant-based foods than to combine them into one refreshing drink you’re sure to keep coming back to? 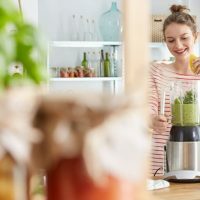 If you’re still not sold to this idea, I’m going to give you five reasons why you can benefit from making green smoothies. Part of what makes green smoothies a health craze is the fact that they simplify and enhance the absorption of nutrients in your body. Imagine having to eat all your vegetables raw just so you can save extra calories that come from additives and flavorings—that’s almost a kind of punishment, right? Even stir-fried leafy greens such as spinach and kale won’t make consumption any easier because you can still taste the bitter flavor of these veggies. I hear this question a lot, especially from friends that have yet to try this gorgeous green goodness, so I’m going to be honest with you: NO, it won’t—provided you know exactly how to improve the taste of the smoothie. 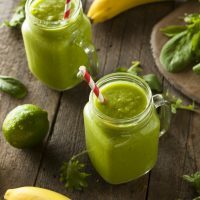 That’s why in this article, I’m sharing with you this incredible spinach banana smoothie recipe so you can say goodbye to the lingering bitter taste of your greens and still enjoy the sweetness brought about by the inclusion of a natural sweetener. A glass of green smoothie has a high fiber content which comes from the leafy greens you throw into your blender. The more leafy veggies you use, the more potent the fiber is in your body so it can easily flush out toxins and improve your bowel movements. 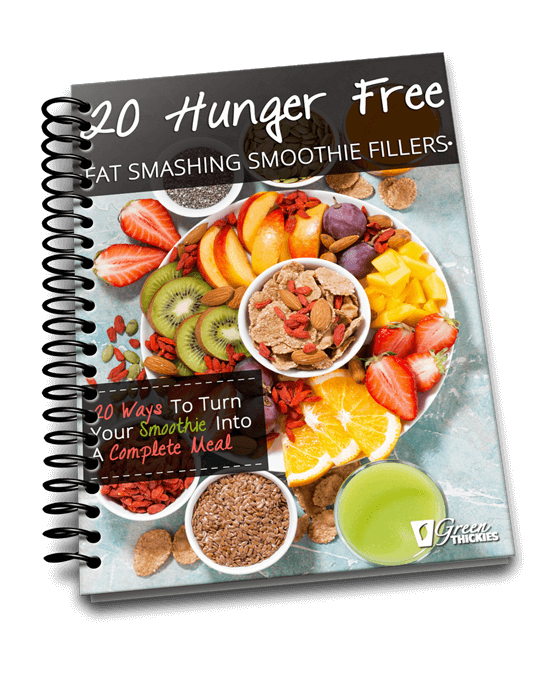 Instead of having to give up snacking altogether just so you can limit your calorie intake, you can substitute green smoothies for junk foods without ever feeling guilty. Interestingly, the fiber from green leafy vegetables also allows you stay full for longer, so it’s like hitting two birds with one stone! 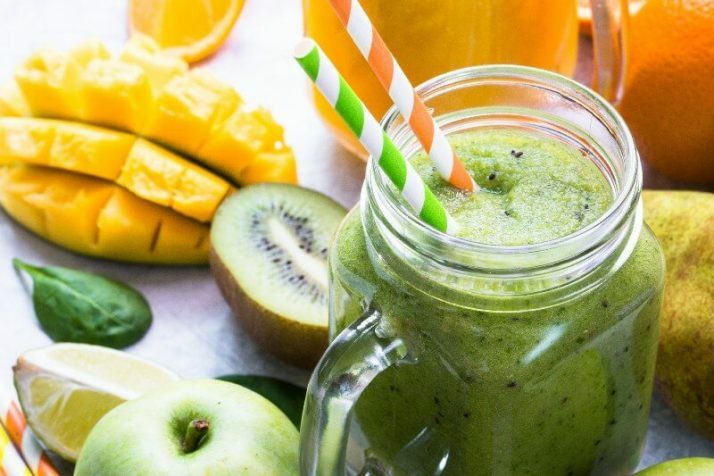 Soon, you’ll even want even more of these green smoothies instead of the processed, unhealthy foods because your tastebuds will change in favor of healthy food. And best of all, your cravings for junk food will diminish to a point of non existence. You will have self control and be able to say no to junk because you literally won’t want it anymore. It might sound a bit too good to be true right now but believe me it works. This has happened to me and so many of my clients. 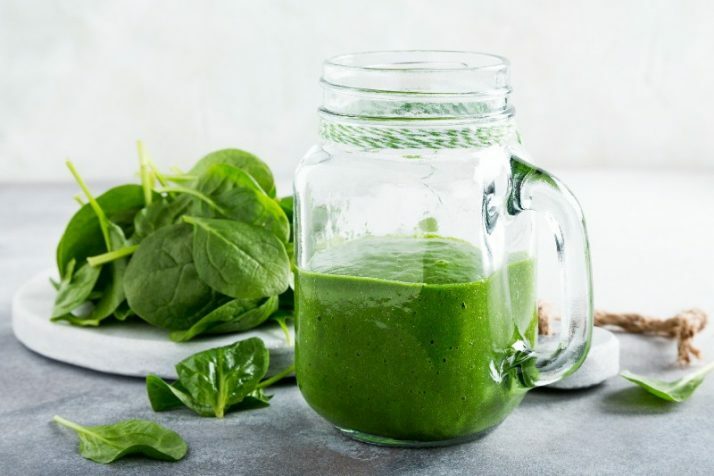 And with this spinach banana smoothie recipe I’m going to show you later, you can take advantage of the combined phytonutrients from these super plant foods. Both spinach and banana are hailed as the best foods you can base your diet on to see an improvement in your immunity. That’s because they are both very high in vitamin C, and all other nutrients needed for a strong robust immune system. Thus, combining them into one refreshing drink not only satisfies your appetite, but also your body’s hunger for the essential vitamins and minerals. Feeling tired? Drink a green smoothie! I’m not just fuelling the hype which it honestly deserves, but because I myself have been relying on daily green smoothies to restore my energy enough to get me through all the tasks required for the day. Not only they are refreshing, but they also boost up your energy so you can function well in everything you do. 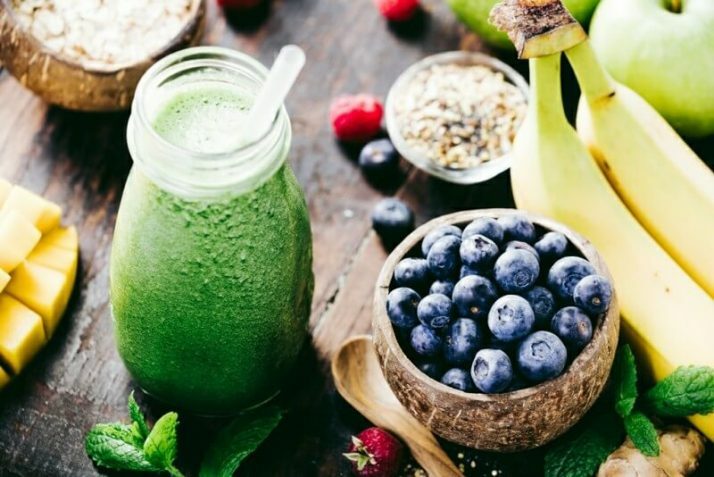 I can think of so many more incredible benefits these green smoothies provide for your body, but I hope that by starting you out with five reasons, you’ll be convinced that it’s time to switch on your blender and start blending those fruits and veggies away. Besides, I still have to familiarize you with the benefits of EACH ingredient you’re going to need for the recipe which I’ve included at the end of this article. Trade your junk foods for a piece of banana and you’ll thank me later, I promise. Lauded for its number of health benefits, banana in a smoothie is a refreshing way to consume this fruit. I have listed down five benefits you’ll get out of including banana in your diet—and in your smoothies in particular! From vitamins and minerals, to macronutrients such as protein and fiber, you’re sure to get something good out of banana in the long run. Unlike your usual sweets, bananas do not cause alarming spikes in your blood sugar levels. This is the type of sweet food that you can indulge in minus the guilt. 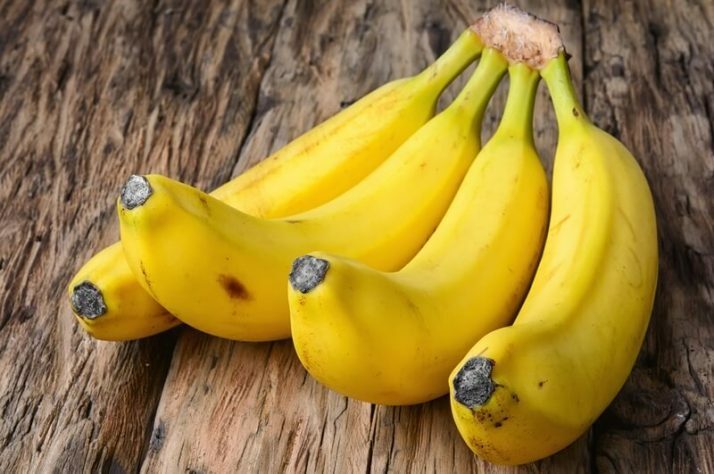 It is because bananas contain fibers such as pectin and resistant starch which aids in moderating blood sugar levels and even improves satiety by making the digestion slower. Additionally, bananas rank low on the glycemic index, which will ensure you that you’re not overloading on their sweetness. This makes bananas an ideal add-on ingredient to your green smoothies as a natural sweetener. Aside from curbing your appetite, bananas are also known to have fewer calories compared to most plant-based foods that are readily consumable. For 100 calories a piece, a banana is a good nutrient source that still keeps you full. Hence, if you snack on a banana or include it in your green smoothies, you can speed up your weight loss dramatically. If you’re concerned about developing cardiovascular health issues, bananas can help you improve this with its potent amount of potassium, which is essential in regulating blood pressure. Bananas are also high in magnesium, which together with potassium can help you keep a healthy heart. This is not just because it’s low-calorie, but a banana also works well before or during exercise as it contain essential minerals and electrolytes necessary to keep you moving while avoiding muscle cramps during intense workouts. 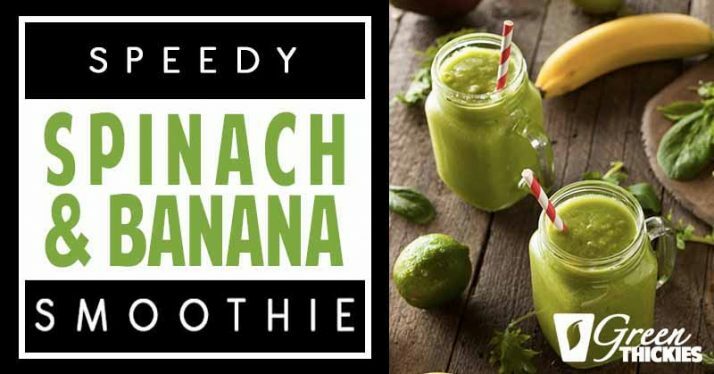 Now that we’re done with the smoothie’s famous natural sweetener, let’s also not forget to list down the benefits of this particular leafy green as a primary ingredient in this spinach banana smoothie recipe. At 23 calories, spinach can limit your chances of getting fat by a significant percentage and you are still be able to absorb its rich protein content of 2.9 grams per hundred grams serving. No wonder Popeye has been known to load up on this superfood. It is best to invest in your eyesight as early as possible so you won’t suffer limited vision when you get older. This can be improved through consuming spinach on a regular basis. It is high in carotenoids—the precursors to Vitamin A—which not only improve your eyesight, but also help in preventing degenerative conditions such as cataracts and blindness. This leafy green is not called a superfood for nothing. Aside from keeping you at the top of your health goals, it also helps you avoid the development of cancers through absorption of components such as MGDG and SQDG which play a role in slowing down cancer growth. Additionally, spinach’s vast reserves of antioxidants only support this claim due to their job in suppressing cancer cells brought about by toxins. Feeling anemic? Then load up on iron from spinach! The reason why your doctor may have prescribed you to eat this veggie is probably due to its high iron content. Iron is essential for hemoglobin formation, which breathes life into your blood and invigorates its circulation so you can perform physical activities with ease. I could go on and on about the benefits of spinach because it’s THAT great for your health. Now I’d like to show you how you can make a spinach banana smoothie so you can see for yourself if what I’ve been rambling about here is true in your own life. This is a very quick, easy and tasty 2 ingredient smoothie that you can make without using any additional liquids. This recipe produces a nice thick green smoothie. Break your small banana into chunks and add to the blender. Blend gradually until the banana becomes a liquid. Green smoothies are generally considered to be a snack because they are too low in calories to be used as a complete meal. This green smoothie contains 328 calories which some people would consider a good amount of calories for weight loss. But for me, this is way too low and you will be left hungry if you eat this low amount of calories in one meal. 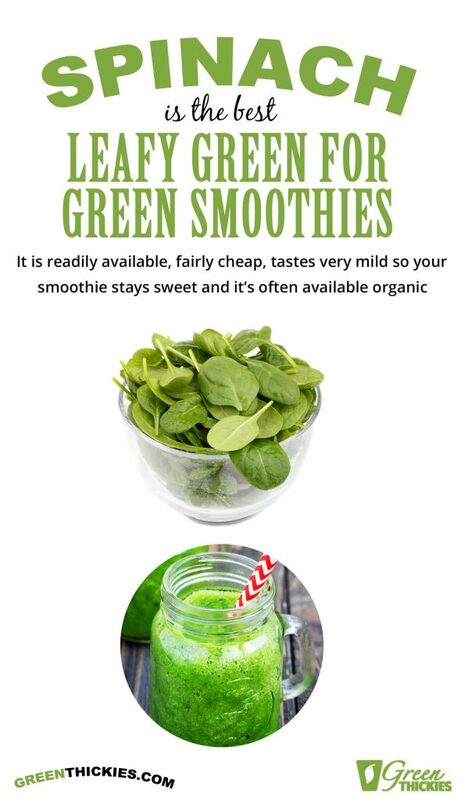 So no doubt, you’ll find yourself snacking on junk food not too long after consuming this green smoothies. The other problem with replacing your meals with a smoothie like this is that it doesn’t contain all of your nutrients needed for one meal. For a start, it isn’t high enough in protein which will also help you to feel fuller for longer. I personally found that I didn’t have time for snacking after I had kids, so now I just replace 2 of my meals each day with a complete meal green smoothie, which I call a Green Thickie. By doing this, I managed to lose 56 pounds in just a few months. You can read my story here. Or watch the video below where I tell you My Story. What I do is I add in extra healthy plant based ingredients into my green smoothie to turn it into a complete meal. 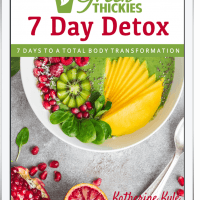 If this sounds like something you would also benefit from, check out my article below which will help you get started with Green Thickies. Now that I’ve shown you how to make your own spinach banana smoothie, I hope you can start enjoying the benefits of green smoothies, all while experiencing a new refreshing way to consume your plant-based foods. Not only will it improve your absorption of fruits and vegetables, but it will also pay you back with optimum health and wellbeing. This is just my basic recipe using spinach and banana, but you can follow this blog for more meal ideas that feature green smoothies. 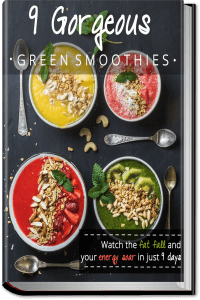 If you’d like more green smoothie recipes, check out my complete guide to green smoothies where I share all my green smoothie snacks AND meal replacement green smoothies. If you enjoyed this article, Speedy Spinach & Banana Smoothie, please let me know your thoughts in the comments.